Algerian lawyers rally, March 23, 2019, to demand the departure of ailing 82-year-old Algerian President Abdelaziz Bouteflika at the end of his term scheduled for April 28, 2019. Algerian President Abdelaziz Bouteflika's days seemed numbered Wednesday, as the country's ruling party and top labor union joined cascading calls for the ailing 82-year-old leader to resign. But the biggest catalyst may have come the day before, when the head of Algeria's powerful armed forces, Gen. Ahmed Gaid Salah, demanded that a constitutional process be set in motion to determine whether Bouteflika, rarely seen in public and confined to a wheelchair since a 2013 stroke, is unfit for office. FILE - In this Feb. 12 2009, photo, Algerian President Abdelaziz Bouteflika waves during a rally in Algiers. In Tunisia, demonstrators hailed the army as a hero for siding with the street and supporting the democratic transition of the first Arab Spring uprising. The role of Algeria's armed forces may be far more pivotal, analysts say, in determining whether it realizes a similarly trajectory, or tips into turmoil. In both cases, history has helped to shape the roles of both institutions. Tunisia's armed forces had little stake in supporting the regime of autocratic ex-president Zine el Abidine Ben Ali, a former officer who came to power in a peaceful coup and then made sure the military stayed weak, analysts say. By contrast, Algeria's army has been a powerful player since independence, a force deeply entrenched in the political system with a mixed reputation in the eyes of ordinary Algerians, as both longtime protector of the nation but also of the current, discredited regime. "Algeria is an army that has a state," said International Crisis Group North Africa analyst Michel Ayari. "Tunisia is a state with an army." Algerian chief of staff Gen. Ahmed Gaid Salah presides a military parade at the Cherchell "Houari Boumediene" in Algiers, July 1, 2018. 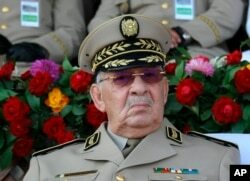 Appointed by Bouteflika in 2004 to head the armed forces, General Salah, who is also Algeria's deputy defense minister, has long been considered a close presidential ally. Last year, he presided over a high-level shakeup reportedly ordered by Bouteflika, which saw more than a dozen military and security officers lose their jobs. "We must adopt a solution that helps us out of this crisis … a solution that respects and adheres to the constitution so that it's a suitable one for all sides," Salah said in a televised address Tuesday. He threw his weight behind a constitutional process that may pave the way for Algeria's senate leader to become short-term caretaker president, if Bouteflika is found unfit. The move, France's Le Monde newspaper wrote, amounted to a crucial "rupture between the army and Bouteflika." "Many officers and generals were sympathetic to the protest movement, and agreed there was need for change and that Bouteflika and his clan needed to cede power," said analyst Ayari. "They intervened early to avoid deepening the democratic demands," he added, "which if they intensify, could even lead to an attack on the army." Many protesters, however, have been underwhelmed by Salah's U-turn, suggesting the army should follow Bouteflika to the exit. "The population doesn't accept it," youth opposition leader Addad Hakim told French radio, reacting to the general's speech. "On social networks and in the street, people are going to keep demonstrating, not just for the departure of a man or a clan, but for a whole system." "Having the army a guarantor of a positive exit to the current crisis is possible and even desirable," wrote Algeria's leading independent El Watan daily. "It's practically the only institution standing, largely united and patriotic." "The army has an important role to play to guarantee the state's stability and the political transition," agreed Brahim Oumansour, North Africa analyst at the French Institute for International and Strategic Affairs, although whether it will remain an impartial arbiter is unclear. 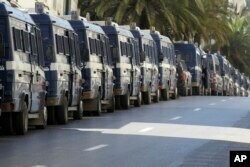 Riot police vans are lining streets around Algeria's capital during a protest in Algiers, Algeria, March 15, 2019. Tunisia achieved its independence largely peacefully and its leaders deliberately kept the country's military weak, analysts say. "It reacted to the 2011 uprising as it had before — by maintaining peace," he said, an expertise acquired during stints by Tunisian forces as U.N. peacekeepers elsewhere. "The army was seen in this romantic way as refusing to fire on the public. But it was actually much more pragmatic — more of a corporate reaction of applying procedure." Algeria's army, by contrast, succeeded from the country's independence fighters who waged a brutal and protracted war with France. Along with the state and the ruling National Liberation Front party, it has since been a dominating force. When Islamists seemed poised to win Algeria's local elections in 1992, the army canceled the vote, triggering a bloody civil war that killed roughly 150,000 people. Elected in 1999, Bouteflika was credited with ushering in peace and reconciliation. Strikingly, he was also Algeria's first long-term civilian president since independence. While Algeria's army crushed the Islamists, its role in the conflict remained opaque, including in the thousands of disappearances that remain unsolved. "Will it be a politically transition completely controlled by the army — as some fear?" asked analyst Oumansour. For the moment however, he said, "there is a real will not to directly intervene in the political process."